Cox’s Bazar, Bangladesh – At first when they came, Dilfaraz, a stout 41-year-old Bangladeshi woman, could not find it in her heart to turn them away. She gave the Rohingyas utensils, mattresses, water, whatever they needed to survive. 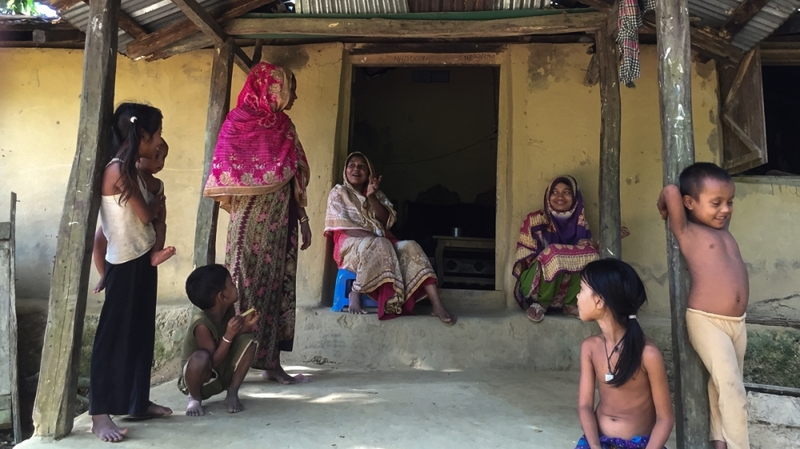 “We are not [Buddhists] and we are not Hindu, we are Muslim and as Muslims we should help other Muslims,” said the mother of five, who has lived in Kutupalong village since 1999. 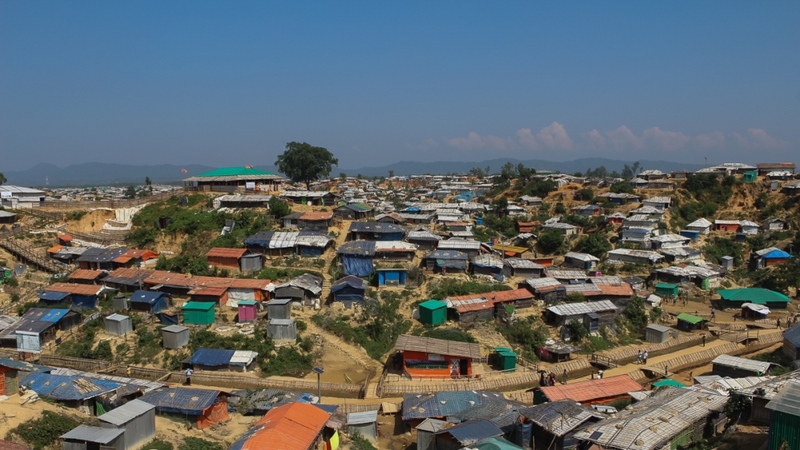 Along with neighbouring Balukhali in Cox’s Bazar district, it now hosts the largest refugee camp in the world. But the goodwill towards refugees has soured over the last year. Like Dilfaraz, Bangladesh is struggling to accommodate over 1 million Rohingya. The exodus began in August last year as the predominantly Muslim minority fled an army-backed massacre in Buddhist-majority Myanmar. 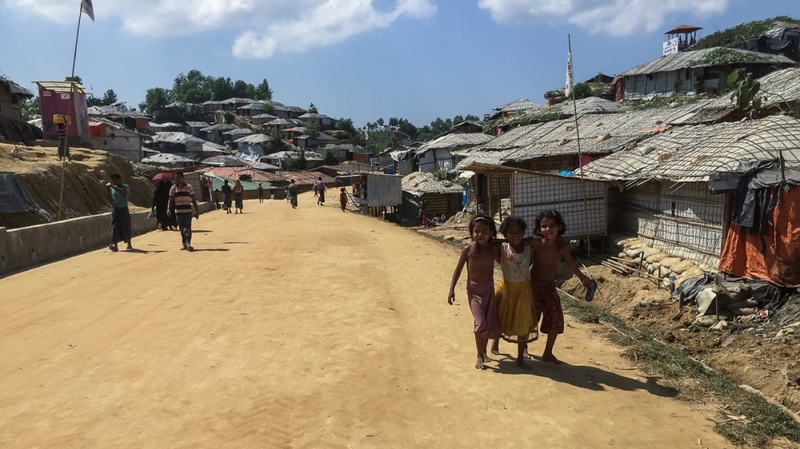 Most Rohingya are terrified of returning to Myanmar, which has persecuted them for decades, so it remains unclear for how long Cox’s Bazar will play host to their suffering. And while the humanitarian crises at the camp have been documented, a different kind of disaster is brewing. The hilly tracts of Cox’s Bazar could foster an environmental crisis brought on by indiscriminate deforestation and vanishing groundwater reservoirs. In the long run, this would make the region more prone to the effects of climate change. If greenhouse gas emissions continue unabated, by 2050, Cox’s Bazar will be the worst-hit district in South Asia as average temperatures rise and rainfall patterns become disruptive, a June 2018 World Bank report found. Living standards, measured in household expenditure, could fall by 20 percent by mid-century. Cox’s Bazar, a strip of land wedged between Myanmar to the east and the Bay of Bengal to the west, has sheltered Rohingya refugees over the decades during ethnic clashes in Myanmar. Some stayed while others returned as tensions subsided. But this time it is different; entire villages have migrated en masse with little to return to. Nur, 25, who works for Dilfaraz’s brother, and says she is grateful to have support in the form of comfortable shelter. “I am not being paid, but they helped us out in our time of need,” Nur said. Her family of eight hails from Buthidaung in Myanmar’s Rakhine state. 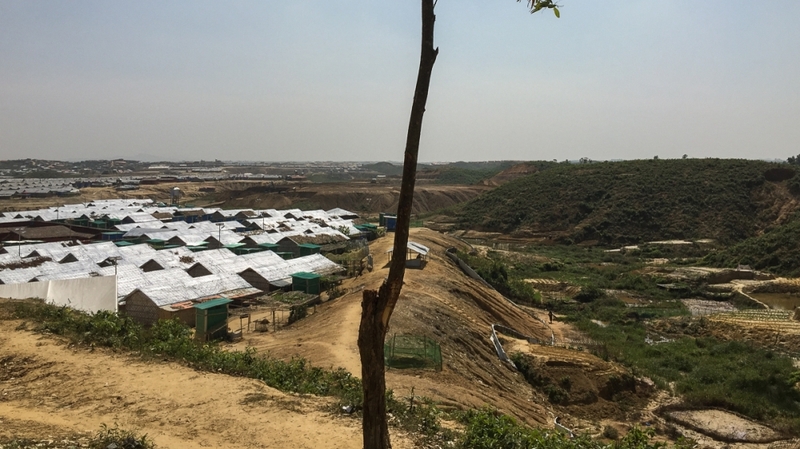 “When we came, it (Cox’s Bazar) looked like a jungle, people just choose their own place to build a shelter, and the whole jungle was destroyed,” Nur recounted. The settlement is now spread across 5,800 acres, and much of it cleared forest land. 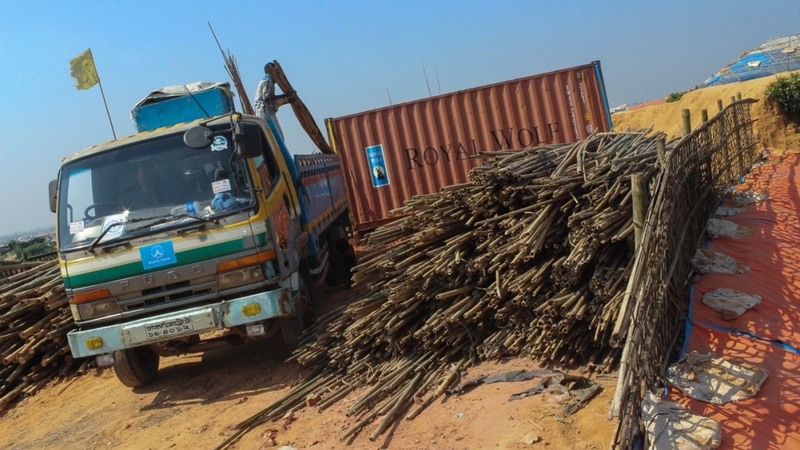 Over 95 percent of the refugees collect fuelwood directly from the forests or buy it in the market. A tiny fraction use LPG cylinders (liquefied petroleum gas) provided by NGOs. The loss of forests and land degradation is dangerous for the precariously placed camps. “In Bangladesh these are not rocky hills, they are soft soil hills. The stability comes from the roots of the trees, if you cut the trees you have destabilised the terrain and there is a risk of hill collapse,” A Atiq Rahman, executive director, Bangladesh Centre for Advanced Studies (BCAS), said. Vigorous monsoons make the area prone to landslides and there is always the lurking threat of cyclones. Disappearing forests are also a sore spot for locals who have watched a vital resource become scarce. In the initial months, shallow tube wells that pump water from about 150 feet were constructed quickly with little oversight. Many shallow tube wells could run dry as demand peaks in summer. In the cramped camps, toilets pits were constructed close to water withdrawal points. Water samples from over 70 percent of wells were contaminated by E. coli, according to WHO. New tube wells are plumbing deeper into the poorly mapped aquifer. Nearby in the camp, a new 650-feet deep hand pump has brought much-needed relief to the refugees. The initial response in the face of political uncertainty is not translating well into a long-term strategy. The World Bank report does not take into account the impacts of the current refugee influx, but notes that deforestation has led to major landslides and harmed property and water resources in the area. “Education, access to electricity, water availability, market access and has a greater share of agricultural households, it may, therefore, become more vulnerable to the effects of temperature rise,” said Muthukumara Mani, lead author of the World Bank report. The report recommends investment in socio-economic development to overcome climate change impacts. But Cox’s Bazar will struggle to do that if the refugee situation remains unresolved. Resentment is brewing among locals as the camps become a fixture of the landscape. Dilfaraz believes that people living next to the camp have paid the heaviest price, while businesses that support the vast machinery of aid have prospered. “The Bangladeshi government has to find a solution,” she said. A plan to repatriate the refugees formulated by the Bangladeshi and Myanmar government, has failed to take off. International agencies have criticised the two governments for ignoring the wishes of the Rohingyas. Terrors of their homeland continue to haunt refugees. Mamtaj, 30, is the mother of two boys and one girl, but only her seven-year-old daughter survived. Soldiers shot her husband, she said. Her five-year-old son was snatched from her arms and thrown into a fire. The 11-year old was shot dead.